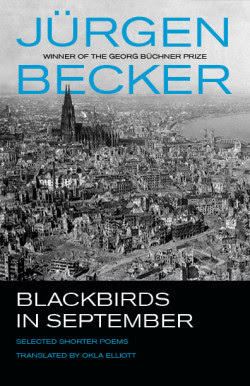 I step out of my comics criticism niche and review the selected shorter poems of Jürgen Becker, BLACKBIRDS IN SEMPTEMBER, translated by Okla Elliott and published by Black Lawrence Press. There is much to enjoy in Blackbirds in September. Becker’s quiet oddities of consciousness and his quiet celebration of moments don’t come at the expense of the realities of chaos and destruction. He acknowledges the transience of beauty and, in that, elevates its precious nature. For such an attitude to have come from someone so inured to destruction so early in his life, Jürgen Becker shows his audience the infinite capacity of the poet for creation and understanding.